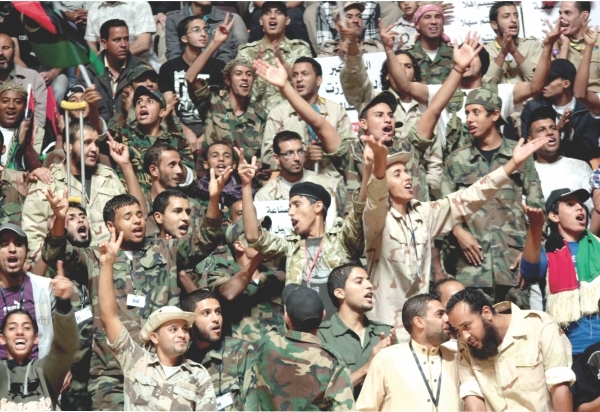 The desert wind is blowing across the Arab spring of change. Democratic activists keep on returning to Cairo's Tahrir square. Muammar is dead! His 42-year old rule has come to an end. Syria's Bashar Assad's brutality is not helping him. He is talking of democratic reform. Even the monarchies are loosening the rigidity of their regimes. Saudi women have been granted voting rights and the right to participate in municipal elections. Mohammad V of Morocco has initiated reforms for the greater participation of his people. King Abdullah of Jordan timely revamped his cabinet to forestall any kind of popular unrest. The bottom line is that the Middle East is not returning to autocratic rule. Even in Malaysia simmering rage against the authoritarian rule of United Malays National Organisation UMNO fought a pitched a battle with the government of Najib Razzak when 50,000 strong protesters came out into the street. There is a bottom line of equanimity for people in every country. It is true for Bangladesh as well. The most recent memory should come into consideration. 1/11 happened because the two major political parties of the country took it to the brink. It is when the Knight Riders took the reins and went on indulging in all sorts of formulas of perceived political scenario under the cloak of a quasi-civil interim administration. The events that led to it catapulted the country into great uncertainty and turmoil. The usefulness of a caretaker government was never in doubt till the then ruling party BNP resorted to tinkering with it by extending the retirement age of judges by two years so that their handpicked person could become the head of the caretaker government. It was followed by the appointment of a person of their choice but with questionable acceptability. The violent protest launched by the then opposition party Awami League brought the hordes from all over the country with logi (pole) and boitha (oar) as tools of protest. Five activists of the other side were bludgeoned to death in broad daylight. The violent protests brought the President into infamy when he took over as the head of the caretaker government and started following the instructions of the party that put him in the post. The country was heading for constitutional breakdown. What followed was the arrival of the Knight Riders as saviours. They experimented over two years and there was little attention that constitutional continuity was being disrupted. This sort of constitutional hiatus has proved to be detrimental to Bangladesh. The political parties certainly understand that the repetition of such a precedent may return the country to the rule of another set of Knight Riders. With the downfall of the autocrat in 1990 Bangladesh unequivocally opted for parliamentary democracy. It is the parliament where the issues of the country are to be decided. Unfortunately, our national parliament continues to remain a chamber for one party deliberation, no matter which party is in power, be it the ruling Awami League or the one in the street the BNP. The cult of boycotting the parliament is continuing since the movement for caretaker government began in 1994. During the BNP's first term the Awami League and other parties were in the street, when the Awami League came to power in 1996 the opposition BNP returned to the street, again when BNP was back in power in 2001 the Awami League returned to the street, when BNP was routed in the 2008 national election it started boycotting the parliament. It is deeply saddening and weighs heavily on national consciousness that the grandest architectural marvel of the country has descended into a house of echo. The Awami League did not put their best efforts in the parliament to mount pressure on the BNP government to accept the caretaker formula or in other words the ruling BNP did not fulfill the bounden duty of accommodating a national issue, which they later adopted in a rubber stamp parliament. When the scenarios changed both Awami League and BNP did not feel the necessity of making a sincere overture to the party in opposition to bring it back to the parliament. Now that the BNP is in the opposition and is vigorously campaigning for the restoration of caretaker system it is neglecting the national responsibility of returning to the parliament to take up an issue of great importance to the country. Road marches and rallies are grand spectacles to behold but the issue at stake a fair election is meant for choosing a parliament where they all belong and which is the mother of all governance. This is where the democratic process of Bangladesh is stagnating. There cannot be a better judge of this debilitating practice than our political parties and politics for it makes governance a matter of combat. A dominant feature of the national politics of Bangladesh is personality cult. The two major political parties have their patron saints. It goes without saying that the two parties religiously chant their political gospels in praise of the patron saints; putting them on a pedestal. Hero worship and dogma have always been a popular culture in many societies of the world. There is a confrontational aspect in it, which cannot be discounted. 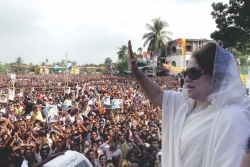 A dynastic legacy is leading the two major political parties – Sheikh Hasina and Khaleda Zia. A number of successors to celebrated leaders are in power or had been in power or are the leading lights behind governments as in India, Pakistan, Sri Lanka, Philippines and more recently Thailand. But the sore point about successors to dynastic legacy in Bangladesh is that there are irreconcilable differences between the two Begums. The present prime minister's disdain for the other party and its leader lies in the fact that she looks on it as a usurper for being baptized in the barracks. The Begum in opposition adds fuel to it by observing her birthday on the mourning day. She stubbornly sticks to it. Pitifully the differences have deteriorated into a verbal slanging match. The bitterness makes politics belligerent and constricts the scope for accommodation. While one calls the other thief and fraud, the other calls the accuser unpatriotic with children living abroad and married to a foreigner. The bile in the bitterness has stooped to a disappointing level. If national effort is to succeed Bangladesh has to come out of it. Recently, the leader of the opposition in a grand rally made a snide remark about the religious faith of the head of the government and in the process disparaged the religious sentiments of a large community of the country. This was unkind and was not in the interest of harmony in the country. Bangladesh is regarded as a moderate Muslim country and even an insinuation on religion can be a dreaded bottom line to which a country can sink. Every nation or a country, no matter how modest its circumstances are, is capable of rising to great heights and it also carries within it the pathogen of self-destruction. Its leaders to a large extent choose the course it takes. It becomes its destiny. Bangladesh has therefore a choice to make. The country looks to its leaders.